Moldovarious.com: How did your relations start with the Republic of Moldova? Dr. Madlener: I had my first contact with the country in occasion of a university trip with my students. In several reciprocal visits I got to know important Moldovans: politicians, university professors, economists. Thus i met Mrs. Gherman, ambassador and daughter of Mr. Snegur, the first president of Moldova. Meanwhile my son is married to a Moldovan citizen and Natalia Gherman is their witness. When was your first time in Moldova and how was your first impression? My first visit dates back to the year 1996. The civil war was over and the country was shattered. The economic conditions were dreadful in this time. I was deeply moved by the hospitality in Moldova. In 1996 there was no tourism and our visit was of such importance that we had to give radio and newspaper interviews. In fact we were just an ordinary group of travellers with interested students. The situaton, however, has really changed. Moldova is a country in upturn with an economic growth of 6%, despite the difficult circumstances. How is the situation in the capital Chişinău? Chisinau, a city with 700.000 inhabitants, undergoes a time of a vast construction boom. There are innumerable shops you can’t find in other cities. In Chisinau you can shop at Armani or Gucci. Nevertheless life is a daily struggle for a huge part of the population. Lots of Moldovans need a second income – if possible even the partner has a second job – to pull through. Bread is financially supported, services are cheap and the rents are relatively cheap. What can you say about life in the country? 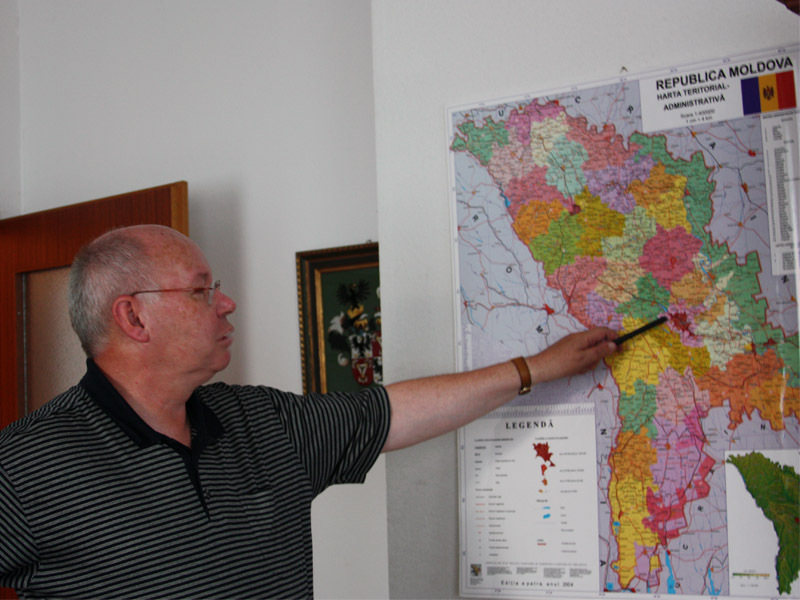 The problem in Moldova is in rural areas. The country loses its inhabitants. A quarter of all Moldovans, which are 1 million people, work abroad. Therefore some villages are deserted. Let’s talk about the autonomous province Gagauzia! The autonomous province Gagauzia is situated in the South of the country. Gagauzia is integrated in the state of Moldova. This minority has Turkish origins and thus the Gagauzians speak Gagauz, a Turkic language, as their mother tongue. The Gagauzians, however, are orthodox. Most likely, because a Turkish army was searching for a refuge at the land of the Russian tzar. The tzar offered them a piece of land to settle down, on condition that they had to be baptized. In a mass baptism they kept their promise and till today there is a Turkish minority which is othodox. What ist the status quo of the renegade province Transnistria? Officially Transnistria doesn’t exist. Transnistria has not been recognised by any state of the world, as far as i know with exception of Abkhazia, a renegade province in Georgia, which is not recognised either. Not even Russia has recognised Transnistria! That is the juridical status. Fact is, that there is a border, Transnistria has its own passports, flag, currency and number plates. Transnistria has a huge industry and has always been richer than Moldova. Today they might be on the same economic level.